‘Extraaa Innings T20’, the show which revolutionized the way cricket matches are analyzed has several new additions to it and promises to wow viewers this year. With Pepsi IPL fever at its peak, this show on Sony MAX and SIX, will ensure that not just the cricket enthusiasts but everyone has an enjoyable watching experience. And of course the glam factor is guaranteed as Archana Vijaya and Shibani Dandekar dazzle the screen along with hosts Gaurav Kapur and Samir Kochhar. The hosts will share screen space with cricket legends some of which include Sidhu, Shoaib, Rameez Raja, Isa Guha, Sunil Gavaskar, Murali Kartik, Aakash Chopra, Arun Lal. In a bid to make the show interactive, for the first time ever the viewers will get a chance to speak to esteemed panelists or the host live during the show to share their views or ask questions about the game. The show will have 2 different sections this year. While one section would focus on news related to the Pepsi IPL the other section ‘what’s hot, what’s not’ would focus on the high points or low points of the tournament. 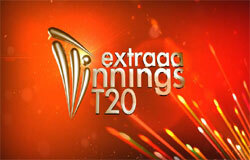 With the music band becoming a regular feature on Extraaa Innings, the show will now keep count of the number of times the panelists or presenters say the words “Thoko band” by having a graphic bug displayed on the bottom of the screen every time the words are uttered, giving scope for contests for the viewers. But what is more unique is that like the Pepsi IPL tournament scouts new talent, ‘Extraaa Innings T20’ is also searching for the most unique anchoring talent through its initiative ‘Cricket kavi ki khoj’. Participants need to record a video and upload it on Sony LIV and the winner will get a chance to come on air. Notable names from the cricketing world who will be commentating in Hindi are Navjot Singh Sidhu, Shoaib, Rameez Raja, Murali Kartik, Aakash Chopra, Arun Lal, Vivek Razdan, Amol Muzumdar, RP Singh & Chetan Sharma. Mr. Neeraj Vyas, Sr. Executive Vice President and Business Head, MAX said, “Extraaa Innings T20 has always engaged audiences and we are taking it a notch higher this year with more interactivity and innovations. With various segments like the live interaction, news on the fun side of the game and talent search we intend to reach out to all sects of audience, especially families”. “Being out there in the stadium, being close to the cricketing action and most importantly feeling the vibe of the fans cheering for their respective team is something that anyone would love to do and I feel very lucky to do it,” says Shibani Dandekar. Catch Pepsi IPL 2015 at its entertaining best on ‘Extraaa Innings T20’ starting April 8th, 2015.